The Afar (Danakil) claim to be descendants of the son of Noah, as recorded in the Bible. They are located in the East African countries of Djibouti, Ethiopia, and Eritrea. 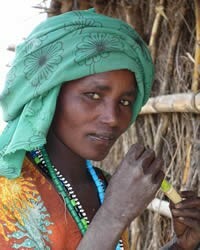 The Afar prefer to be known as the Afar, since the Arabic word danakil is an offensive term to them. They are a proud people, emphasizing a man's strength and bravery. Prestige comes from killing one's enemies. 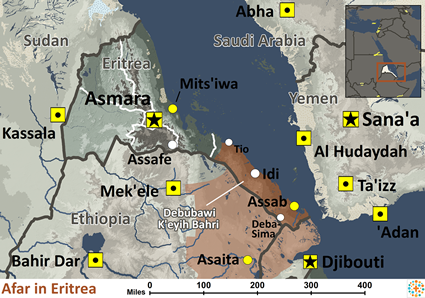 The Afar consist of two sub-groups: the Asaemara ("red ones"), who are the more prestigious and powerful nobles living along the coast; and the Adaemara ("white ones"), who are the commoners living in the mountains and the Danakil Desert. Those who live in the desert inhabit one of the most rugged areas in the world. One region, known as the Danakil Depression, consists of a vast plain of salt pans and active volcanoes. Much of it lies 200 feet below sea level and has daily temperatures as high as 125 degrees F. The average yearly rainfall is less than seven inches. Most of the Afar are nomads who raise sheep, goats, cattle, and camels. A man's wealth is measured by the size of his herds. The women are responsible for tending the sheep, cows, and goats, and for looking after the camp. The men care for the camels and donkeys, and take down the camp when it is time to move. Not all of the Afar are herdsmen. Some of the Asaemara who live on the coast are fishermen, while many of the Adaemara mine salt. Those who work in the Danakil Depression pry loose slabs of solid salt during the dry season, supplying ready-to-use salt in the form of crude blocks. Although some Muslims are permitted to have four wives, Afar marriages are usually monogamous. Girls may marry as early as age ten. Marriages between first cousins are preferred, particularly between a man and his father's sister's daughter. The night of the full moon is favored for a wedding ceremony, and the presence of someone able to read the Koran is required. Meat and milk are the major components of the Afar diet. Milk is also an important social "offering". For instance, when a guest is given fresh warm milk to drink, the host is implying that he will provide immediate protection for the guest. If a person is killed while under the protection of an Afar, his death must be avenged as if he were a member of the clan. The Afar live in camps surrounded by thorn barricades, which protect them from the attacks of wild animals or enemy tribesmen. Their oval-shaped huts, called ari, are made of palm mats and are easily moved. Early in their history, the Afar were heavily influenced by the Islamic religion; and today, Islam is still held in great esteem. The people do not eat pork and rarely drink alcohol. Those who can afford to do so, make a pilgrimage to Mecca. In addition, many pre-Islamic beliefs and customs are also prevalent among the Afar. They believe that certain trees and groves have sacred powers. They also have various religious rites such as anointing their bodies with ghee (a type of butter). Spirits of the dead are believed to be very powerful, and a "feast of the dead", called Rabena, is celebrated each year. They also give annual offerings to the sea to ensure safety for their villages. Many people wear protective leather amulets that contain herbs and verses from the Koran. Because the Afar are a proud, independent people, they have had a very turbulent history. In recent times, the government has built houses with kitchens and bathrooms - luxuries previously unknown to these nomads. There is a great need for pure water sources for the Afar and their herds. In recent years, they have suffered because of famines and drought in the region. * Ask the Lord of the harvest to send forth additional laborers into Eritrea. * Pray that God will grant wisdom and favor to missions agencies focusing on the Afar. * Ask God to anoint the Gospel as it goes forth via radio to this tribe. * Pray for the small number of Afar believers and ask God to give them opportunities to share Christ with their own people. * Ask the Lord to bring forth a strong Afar church for the glory of His name!View Afar in all countries.